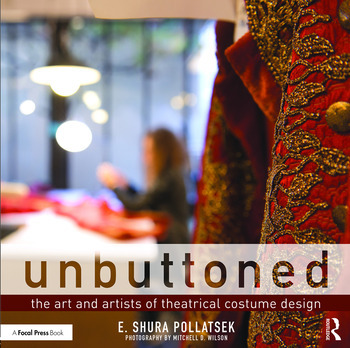 Unbuttoned: The Art and Artists of Theatrical Costume Design　documents the creative journey of costume creation from concept to performance. Each chapter provides an overview of the process, including designing and shopping; draping, cutting, dyeing, and painting; and beading, sewing, and creating embellishments and accessories. This book features interviews with practitioners from Broadway and regional theatres to opera and ballet companies, offering valuable insights into the costume design profession. Exceptional behind-the-scenes photography illustrates top costume designers and craftspeople at work, along with gorgeous costumes in progress. E. Shura Pollatsek is a professional costume designer for stage and screen, an Associate Professor of Costume Design and Technology, and an award-winning author of several nationally published articles. She designs costumes for performances across the United States and internationally, and for National PBS television and Showtime. During a decade based in New York City, she worked for Off Broadway and Broadway productions, the Metropolitan Opera, and at many leading regional theaters. Mitch Wilson is a National Press Photographer of the Year winner, who travels the world capturing time and place in stills and motion. His work has also been recognized with Primetime Emmys, both the DuPont Columbia Award and the Peabody for Excellence in Broadcast Journalism, two International Documentary Association Awards for Best Documentary Series, and many others. He began his career as a Combat Cameraman and underwater photographer in the elite Combat Camera Group of the U.S. Navy.